In this inaugural edition of “Kings-in-Waiting”, where I look at Los Angeles Kings prospects honing their craft in juniors or abroad, I focus my attention on goaltending prospect Matthew Villalta. The 18-year-old was taken with the Kings’ third-round selection, 72nd overall, in the 2017 NHL draft. The netminder was born and raised in the hockey haven of Kingston, Ontario (I will spare you the cheesy “King” pun). The city is well known for producing NHL stars such as Doug Gilmour, Kirk Muller and Wayne Cashman, and, most notably, is the birthplace of controversial Canadian hockey icon Don Cherry. Villalta took the rather unconventional route of not being drafted into the OHL. Instead, he left his hometown team, the Greater Kinston Jr. Frontenancs Midget AAA of the ETAHL, and managed to secure a backup role in 2016 with current club, the Sault Ste. Marie Greyhounds. The “Soo” thought that they had secured a solid goaltender for the immediate future when selecting Joseph Raaymakers in the second round of the 2014 OHL draft. Unfortunately, Raaymakers did not live up to his draft status and posted pedestrian save percentages under .900 in his first three years with the team and has since been jettisoned to the London Knights. Enter: Matthew Villalta. To say that Villalta took the bull by the horns in the 2016-17 season would be a gross understatement. The 6-foot-2, 170-pound goalie posted a jaw-dropping 25-3 regular season record with the league’s fourth-best save percentage (.918). His stellar play resulted in him taking home the FW “Dinty” Moore Trophy for the league’s lowest rookie goals-against average (2.41). Villalta has been an integral part in leading his team to an astounding league-best record of 51-6-2-2 through 61 regular season games. Fortunate for the backstop, he is surrounded by a plethora of future NHL talent in Morgan Frost (2017 first-round pick), Taylor Raddysh (2016 second-round pick), Boris Katchouk (2016 second-round pick) and Connor Timmins (2017 second-round pick). It will be exciting to see if the Greyhounds can sustain this elite level of play and make a run at this spring’s Mastercard Memorial Cup. Although the list isn’t as impressive as players born in Kingston, the Kings have dipped their toes in the Greyhound water in the past. In the fifth round of the 2012 draft, then-Kings general manager Dean Lombardi selected defenseman Colin Miller. Miller, currently a steady defenseman with the Vegas Golden Knights, was involved in the Milan Lucic trade back in 2015. He played for two seasons with the then-Kings AHL farm team, the Manchester Monarchs, but never managed to get a call-up to the big club. The most recent notable Greyhound draft pick was forward Jordan Nolan. He was drafted in the seventh round of the 2009 draft and made his NHL debut in the 2011-12 season. The 28-year-old Nolan amassed a respectable 292 games over a span of six seasons with the Kings. His gritty and tenacious style of play earned the fondness and respect of fans and afforded him the chance to secure two Stanley Cup rings (2012 and 2014). The bad news for Villalta is that Kings incumbent goalie, Jonathan Quick, is only 32 years old and likely has a few more productive seasons left in the tank. The good news is the sought-after “goalie of the future” role is still very much up for grabs. Jack Campbell is a name that has recently resurfaced due to the February trade of Darcy Kuemper. Campbell was thrust into action last week and was impressive in notching his first NHL victory over the Golden Knights, 4-1. Campbell’s career has been mired in lacking NHL action, only tallying a total of three games over a nine-year professional career. Campbell is still relatively young (26) and his narrative is a compelling one, but his future ceiling looks to be that of a career backup. Ironically, he also played for the Soo Greyhounds in his junior career (2011-12 season). Much like Villalta, Cal Petersen has had an interesting path to becoming a future NHL pro. 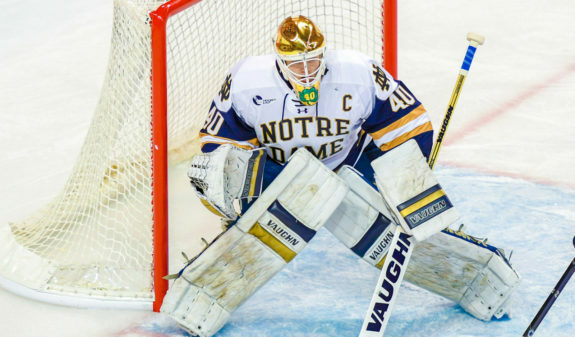 Originally drafted by the Buffalo Sabres in the fifth round of the 2013 draft, Petersen refused to sign a contract with the club and decided to go the U.S. collegiate route and play with the Notre Dame Fighting Irish. After three impressive seasons with the Irish, Petersen officially became a free agent and signed with the Kings in July 2017—much to the chagrin of Sabres fans. Since turning pro, Petersen has appeared in 27 games for the Kings’ AHL affiliate, the Ontario Reign, posting a favorable 16-9-1-2 record. Petersen is undoubtedly Villalta’s biggest threat to become Quick’s heir apparent. 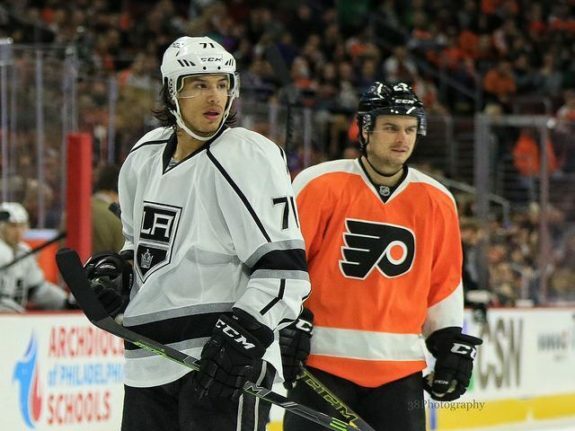 Should he continue his consistently strong play, Petersen will likely earn a call-up as early as next season and get the chance to impress the likes of general manager Rob Blake and head coach John Stevens. Despite being an OHL rookie, Villalta has taken over for the Hounds and now ranks top-five in goals-against average with a 2.47 mark. The kid’s got size, calmness and plays his angles well. The 24-2-1 record’s not bad, either. Villalta’s calm disposition and fundamentally sound game are definitely his strong suits. Given his current physical status, it is no surprise that Villalta will need to dedicate himself the weight room in order to add muscle to his lanky frame. In addition, he will need to work on his rebound control in order to maximize his future potential.